A nice holiday side dish. 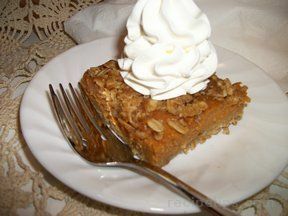 Can be prepared ahead, up to the baking, and covered and refrigerated overnight. Remove from refrigerator 1 hour before baking. Coat a 9x13-inch casserole with nonstick cooking spray. Preheat oven to 325 degrees F.
In a large, heavy skillet, melt the butter over medium heat. Add pecans and saute 2 minutes. Stir in remaining ingredients; saute an additional 2 minutes. Spoon onto a piece of foil and cool. (Can be done 24 hours in advance and stored it a covered jar). Bring a large pan of water to a boil and add the carrots. Cook 5-7 minutes. The carrots should be tender, yet firm. Drain and rinse with cold water until cooled. Pat dry with paper towels. Melt the butter in small saucepan. Combine with remaining ingredients. Toss carrots with butter mixture. Spoon into the prepared casserole. 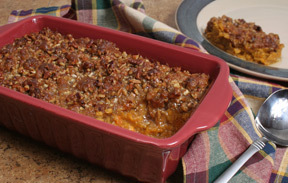 Sprinkle the spiced pecans over the top and bake 20-25 minutes just to heat through.